These two photos have already been seen by the people who follow me on the Book of Face, but as an open notebook of What I Is And Wherever It Is I Be Going, they belong as scrap here, as The Wife™ has pointed out (using different words but the intent is most clear). I'm using reduced-res versions intended for web posting, so the date of the photos are up to recollections sake. The metadata seem to have been clobbered, somehow. This lovely shot is another one from the stretch of NE 122nd Avenue, just south of Shaver Street. If there's a reason I've developed a staunch affinity for this patch of ground, a working farm now well within the urbanized precincts of Portland, I'd be selling it short; there are many. But just one is it offers a postcard-ready reveal of Mount Hood, and I've rattled on ad nauseam about how much I adore looking at that peak. This was a January morning, one of those ones where I'd hoped that the cloud cover would just nick the summit so I could have my own photo of one of those sundial-shadows that we've seen over the past season, where fall was held over into winter. No luck there, but this is a satisfying consolation prize. This one was more recent, toward the end of February, with a fog bank closed on the area somewhat south of SE Stark Street in the Mall 205 area. POV for this is the NE Glisan Street overpass on I-205. 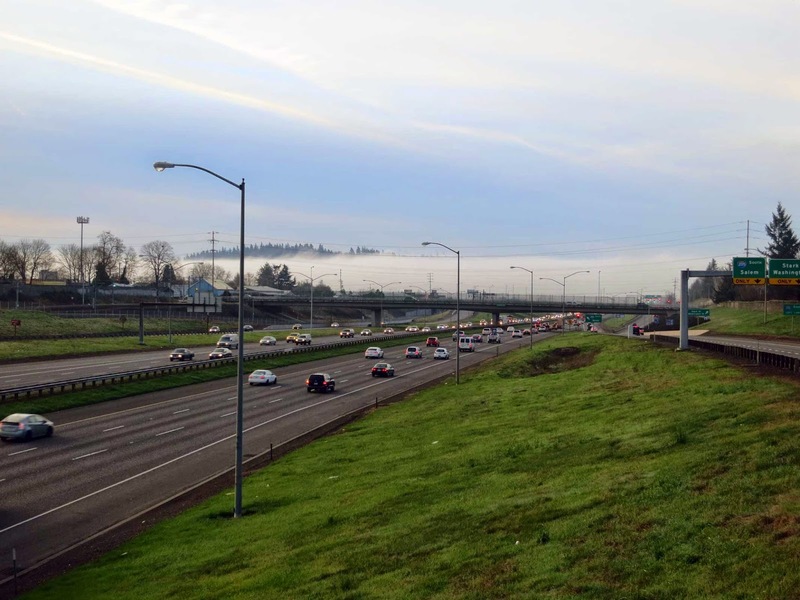 The fun part of this is that way the perspective makes it appear as though the Burnside Street overpass (the one that is actually visible) is keeping the fogbank from settling on I-205. In reality, the fog drew a preternaturally-straight line along Stark Street (which is obscured b foreground objects), but it looks as though the fog-free area goes quite a ways back, thanks to Portland's obviously-unicorn-and-magical-girl-powered public works. The distance to Burnside Street is about 1/4 of a mile. The fog is about 1/2 mile away (NE Glisan to SE Stark is 10 blocks, and there are 20 to the mile here).